Dance Commentary by Heather Desaulniers: "The Christmas Ballet, Uncorked!" The twentieth edition of Smuin Ballet’s annual holiday production did not disappoint. With equal parts traditional and contemporary dance works, “The Christmas Ballet, Uncorked!” closed 2014 with a hearty dose of festivity and celebration. 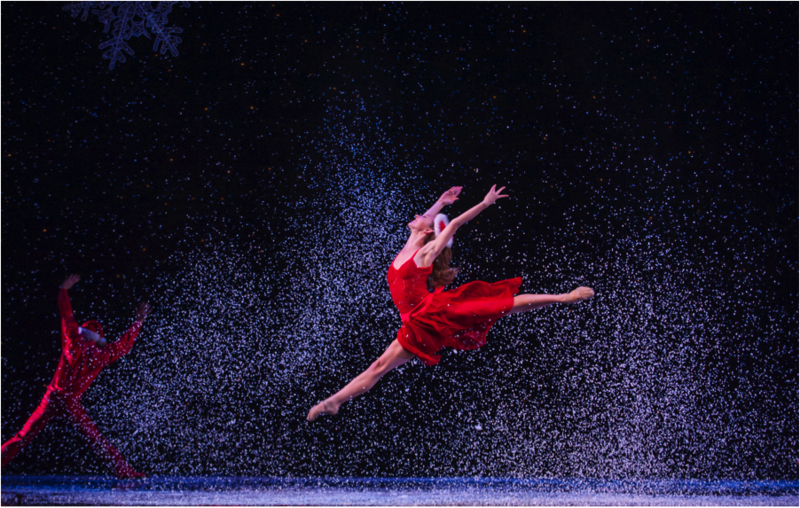 Titled ‘Classical Christmas’, Act I is all about technical ballet and time-honored holiday music. And of the fourteen short scenes, several (both returning favorites and new premieres) were stand out hits. Michael Smuin’s “Domine” was an elegant vehicle for company veteran Susan Roemer and newer Smuin dancer Nicole Haskins; both women floated ethereally throughout the entire duet. Choreographer-In-Residence Amy Seiwert experimented with the challenging pas de cinq structure in “Caroling, Caroling/Bright, Bright”. Lightness immediately abounded as the cast entered from stage right, and they aptly handled Seiwert’s significant choreographic requirements. Roemer again proved herself as a star of “The Christmas Ballet, Uncorked!” with her interpretation of Smuin’s “Ave Maria”. From simple walking to flat-footed promenades to contemporary piqué turns, she captivated. Almost all dancers perform solo work, but not every dancer can command the stage during a solo like Roemer did on Christmas Eve. Always a treat, “The Gloucestershire Wassail” is a delightful marriage of cultural/folkloric/Celtic movement and percussive dance. The unison in this piece has been better in previous years, though this particular cast made up for it with their pure, palpable, authentic joy. Act I’s second premiere, Nicole Haskins’ “Fantasia”, was absolutely lovely. As is common with most fantasia-forms, Haskins opted to mix styles, genres and structures to create a fun and unique hybrid. It was such a success, and had an almost ‘cheeky’ ending as Terez Dean leapt into Jonathan Powell’s arms. Following intermission, we were onto the sixteen segments that make up Act II’s ‘Cool Christmas’. Company dancers Weston Krukow and Ben Needham-Wood choreographed the new premieres for this second half, “Mean and Green” and “Frosty the Snowman”, respectively. These humorous romps provided a nice addition and variety to an Act that otherwise was a little too similar to the past few year’s productions. Having said that, Sarah Nyfield sparkled in “La Calandria”. The foot percussion mixed with pointe work was out of this world and her petit allegro combination, particularly the assemblés, was something to behold. Nyfield also has these strong, lingering balances that Smuin Ballet, or the new Smuin Ballet, is becoming known for. Every season, Smuin Ballet produces a variety of work in different formats, with one of the favorites being a collection of shorter scenes. This year’s “The Christmas Ballet, Uncorked!” contained a remarkable number - thirty vignettes of varying length. And while the production came in at a very reasonable two hours, it does seem like each Act could afford to have slightly fewer sketches.